The right features, performance, and price—Commander MAX XT is built with 4 seats, best-in-class power, a versatile dual-level cargo box, and rider-focused features perfect for the job site or the trails. ROTAX V-TWIN ENGINE: Take command of a thrilling 92 hp Rotax® 1000R liquid-cooled V-Twin engine with four valves per cylinder and single overhead camshafts featuring twin fuel injectors that optimize fuel delivery into the combustion chamber for powerful yet precise performance. COMFORTABLE SEATING FOR FOUR: You'll enjoy ample seating for all passengers, with a generous 106.1 in. (269.4 cm) wheelbase. There's grip where it counts too, with individual handholds for all passengers—no shared grab bars here. INTELLIGENT THROTTLE CONTROL (ITC): The Can-Am Intelligent Throttle Control (ITC) throttle-by-wire system ensures smooth power delivery via precise control of its 54 mm Bosch† throttle body—even if the driver's foot is bouncing due to rough terrain. ITC detects unwanted bounces and filters the input, with selectable progressive and Sport modes. TORSIONAL TRAILING ARM INDEPENDENT (TTI) REAR SUSPENSION: You're looking at the only independent rear suspension that eliminates scrub and camber changes, meaning the wheels pivot up and down rather than in a butterfly motion. This ensures the vehicle moves only in the direction you point it. Reconfigured for improved traction and optimal transfer of power to the ground. 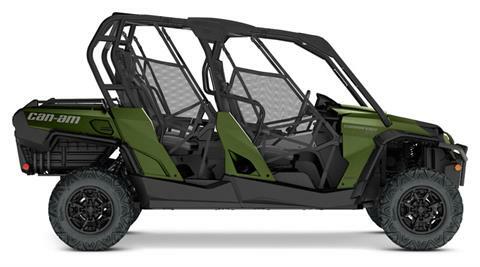 DOUBLE A-ARM FRONT SUSPENSION WITH SWAY BAR: The Can-Am Commander's Double A-arm front suspension is designed with dive-control geometry that works to eliminate diving under heavy braking and rough terrain. The front end features 10 in. (25.4 cm) of travel and five-way preload-adjustable motion-control shocks. TRI-MODE DYNAMIC POWER STEERING (DPS): Three (3) levels of rider-adjustable steering assistance give DPS models the ability to adapt steering feel to match the terrain while also reducing kickback. The amount of assistance varies with speed, adjusting input naturally and only as much as needed. 27 in. (68.6 cm) MAXXIS BIGHORN 2.0 TIRES ON 14 in. (35.6 cm): The lightweight radial tires offer a smoother ride, predictable cornering and optimum climbing confidence. They are mated to cast-aluminum wheels that feature a strong yet lightweight construction. DUAL-LEVEL CARGO BOX: What a finish: this versatile and usable cargo box design has a 600 lb (272 kg) cargo capacity, dual storage levels, anti-rust box, and tilt-assist dumping. 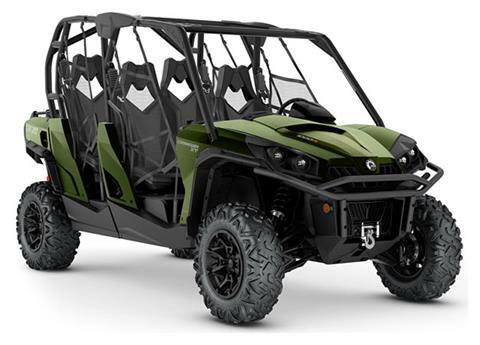 Commander offers two levels separated by a removable water-resistant panel to separate the upper and lower beds and their independent tailgates. HEAVY-DUTY FRONT BUMPER, BED RAILS & MUDGUARDS: We've fitted the Commander MAX XT with a heavy-duty front bumper for a beefier look and better functionality. Bed rails installed on the dual-level cargo box add more tie-down points for cargo carrying. Below, mudguards create an extra layer of protection for the occupants and keep debris where it should be. 4,500 lb. 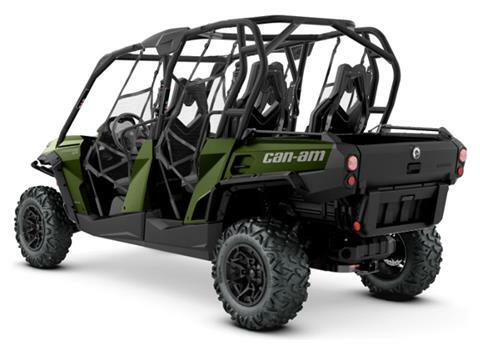 (2,041 kg) WINCH: Can-Am chose a premium winch kit for the ultimate performance and durability—we've seen what people do with their machines. The 4,500 lb winch includes dash control and roller fairlead for precise operation.